When I first became involved in the idea of Capital 35 years ago, I was excited by the thought of being able to work with the large British Aerospace and Defence companies. As the years have progressed we have moved into new technological industries; Space and Satellite, Telecommunications and Automotive. We are now working with some of the world’s largest companies and providing key resources to support amazing projects. Engineers we have placed over the years have worked on projects which have made international news; ‘the worlds’ largest jet engine’, ‘the world’s largest passenger airliner’. There is always a buzz when I know Capital has played a part in the creation of a World beater. I’ve seen big announcements on television about projects where I know that Capital provided clients with the expertise when they needed it. I built Capital on some key beliefs. The company values have always been at the heart of the business, it is the ethos against which we drive everything we do. Treat people as you expect to be treated yourself. Be trusted and always tell the truth. Help candidates improve by giving them constructive feedback following interviews. Ensure that you act in everyone’s interests, Candidate, Client and Capital, to ensure a successful outcome for all. I always wanted a Company I could be proud of, from the service we offer to the calibre and commitment of our employees. I know all my employees are committed to doing the best job they can; no one makes a mistake on purpose, but things do sometimes go wrong. I encourage all staff to see problems, complaints and failures as learning opportunities. We may find that one of our processes could be improved, that more training is required, or a new way of working might be revealed. These discoveries are how Capital can continuously grow and improve. The drive to be one of the best in recruitment has resulted in my deep belief in the importance of training. This stems from the very first days of Capital when I did everything myself. I eventually realised I needed help, so recruited my first employee. I needed to ensure that they would deliver the same level of service and commitment that I felt made the difference between Capital and our competitors. 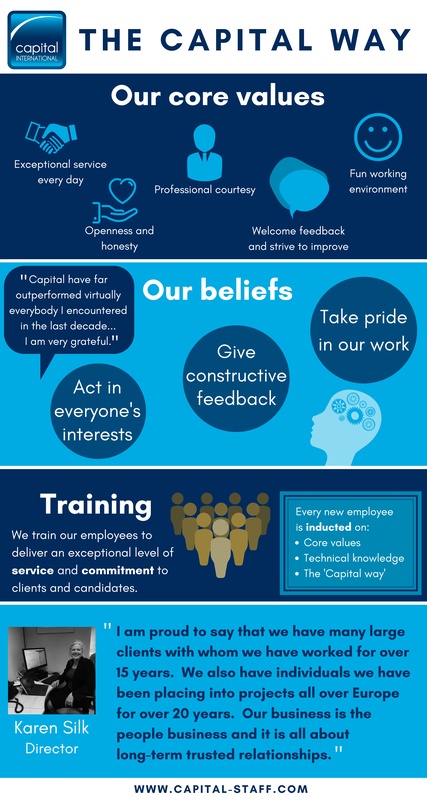 This training eventually evolved into the induction programme that every new employee goes through upon joining Capital. The induction focuses on our core values, gaining technical knowledge of our sectors and the ‘Capital Way’. I am proud to say that, due to the standard of our service, we have many large clients who we have worked with for over 15 years. We also have contractors we have been placing into projects across Europe for over 20 years. Our business is the people business and it is all about long term trusted relationships.